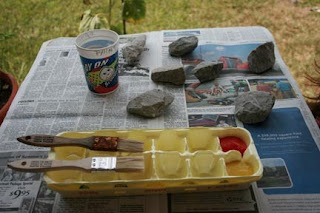 Painting rocks is one of our new favorite activities. I bought liquid tempera paint a while back, and we paint on paper from time to time. 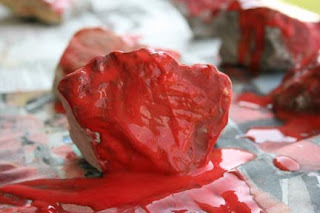 There's just something about the tactile, sculptural feel to painting a rock that we both like, though. The rocks in our yard are mostly large gravel pieces that were left behind from the construction equipment when our house was built. There are also quite a few man-made rocks - chunks of concrete with gravel in them. Once they have paint on them, you can't tell what they used to be! The tempera paint is kind of gloppy, and I noticed that they didn't dry when we left them outside. 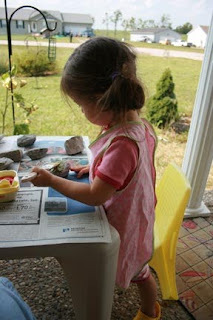 Of course, Abigail kind of pours the paint on and then starts painting the newspaper and herself too. The smock she is wearing was a birthday present from me. I made it using the swing-swing smock in Bend the Rules Sewing by Amy Karol. I made two, one from the full size pattern Amy suggests and one a little smaller. Abigail is very small for her age, and I just thought the big one was too big. Turns out that it isn't. We mostly use the larger size. I made them thinking she could wear them around the house or something, but I can only get her to wear them if I ask if she wants to paint. She at least knew where they were and what I was talking about though.